This easy angel food cake recipe is a favorite around our house. I don’t know why I make it more often. I think it is because my mother never was successful at making it and now I have an ingrained fear that I will burn it (though I have never burnt an angel food cake yet). If you are in need of eggs, stop by the farm and pick up a couple dozen brown eggs. 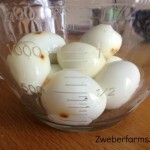 Click here for current egg prices. Our hens are laying about nine dozen a day. 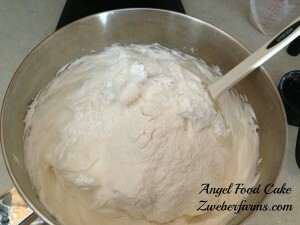 Sift together the flour, cornstarch and 3/4 cup sugar. 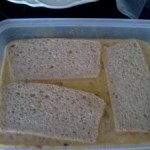 You will want to sift the ingredients several times so that they are good and aerated. Separate the yolks and whites of your eggs. 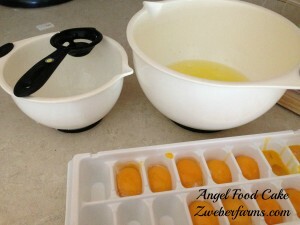 You can freeze the yolks up to three months. I freeze mine in an ice cub tray. 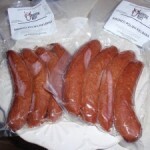 Once they are frozen, put them in a ziplock bag and use as needed. 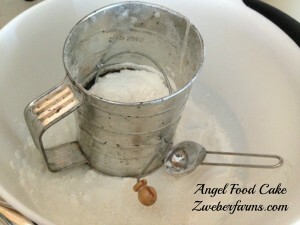 Gradually add the remaining 3/4 cup sugar while continuing to whip. 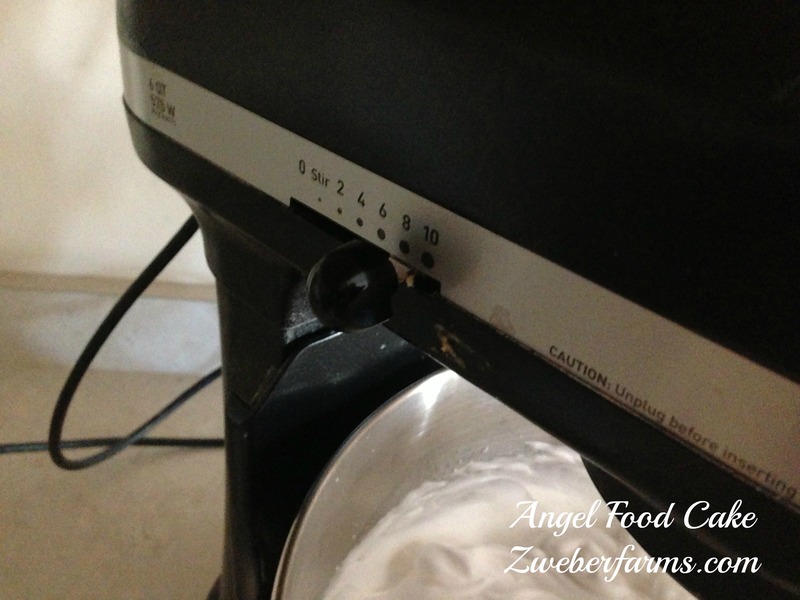 Don’t be afraid to crank up your mixer. You will want to whip until stiff peaks form. 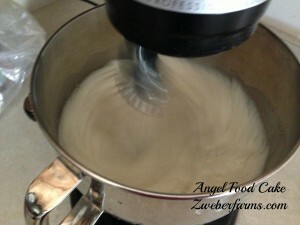 Gently fold in a third of the flour mixture at a time. It is important not to overmix. Make sure your tube pan is clean, dry and free of residue. Then gently put the batter into the pan. Bake for 30-40 minutes. 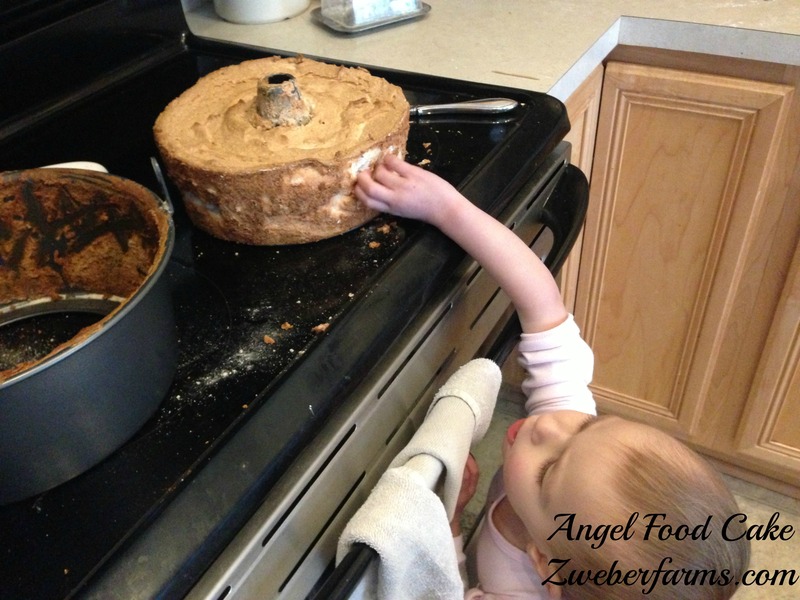 The cake is done when it bounces back when touched. Invert your pan to cool. My pan has built in kick stands. You can also stick the pan on a bottle. Hannah tried sneaking some cake before I got it off the pan. 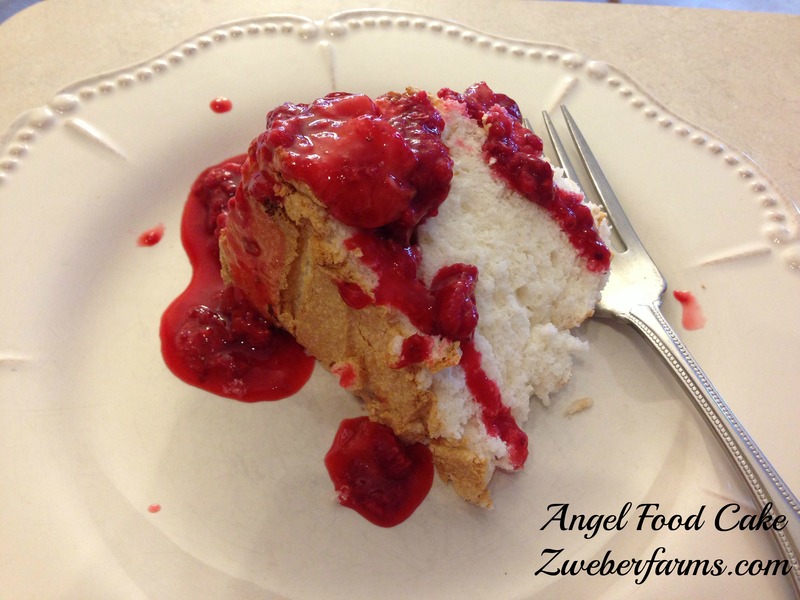 Enjoy this easy angel food cake recipe with a sauce made from frozen organic strawberries, raspberries and a pinch of sugar. 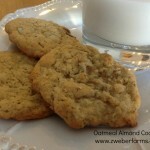 Jen over at Food and Family has a great list of recipes to use up those egg yolks. Easy Angel Food Cake recipe. This cake is light and fluffy and will taste like heaven in your mouth. 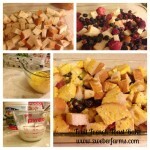 Serve with a fresh fruit sauce. 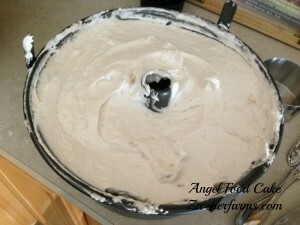 Next make sure your mixing bowl is clean before you start. You will not want any oil residue. Then whip your egg whites with the vanilla, cream of tartar and salt to medium stiff peaks. They will start to get "bubblely"
Don't be afraid to crank up your mixer. 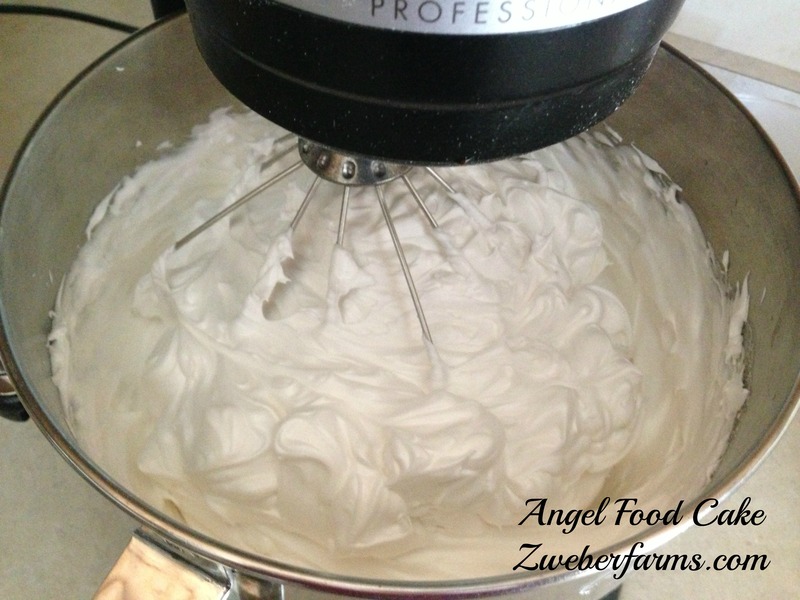 You will want to whip until stiff peaks form. 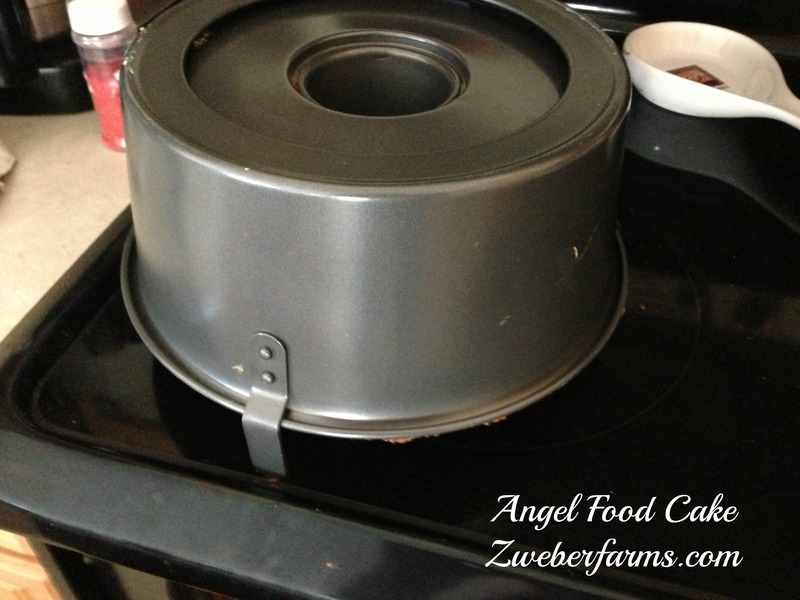 Invert your pan to cool. You can also stick the pan on a bottle. Enjoy with a sauce made from frozen organic strawberries, raspberries and a pinch of sugar. Your sugar measurement seems a bit off. Is it 1 1/2 cup? Yes that is a typo. I will fix it to say 1.5 cups. Thanks for catching that!